In Australia, Blueberries are my favourite berries. 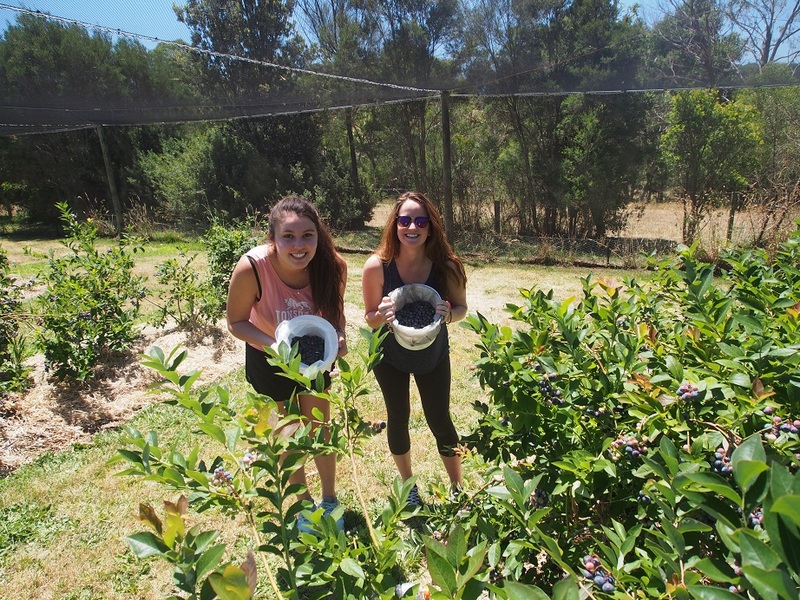 Every year I organise Blueberry picking trip to one of the local organic blueberry farms. Magic Tablecloth. My daughter and a friend are picking blueberries in December 2015. The blueberries can be stored fresh very well at low temperatures for up to 1 month. They don’t just stay fresh but they also retain all their qualities that provide health benefits. There is research just on that, and ‘The results suggested that sufficient available energy status and a stable enzymatic system in blueberries collectively contribute to improve chilling tolerance, thereby alleviating pitting and maintaining quality of blueberry fruit in long-term cold storage.’ (Food Chemistry, Volume 164, 1 December 2014, Pages 493-501). We collect more blueberries than can be consumed in one month, so I pack the rest of berries in small bags and freeze them. As a result, we can enjoy the blueberries throughout the year till the next season. Wild blueberries are rich in polyphenols, molecules that have antioxidant properties, and have several potential health benefits. There are many studies that evaluate blueberry’s biological significance and efficacy as functional food ingredient. It has been proposed that metabolites created during colonic fermentation may be the components that exert the health benefits of the blueberry. Whilst researching the Blueberry I found an interesting study that compared the Blueberry and the Black Chokeberry (Aronia). Unfortunately Black Chokeberries are not common in Australia but they are my absolute favourite berries. Magic Tablecloth. 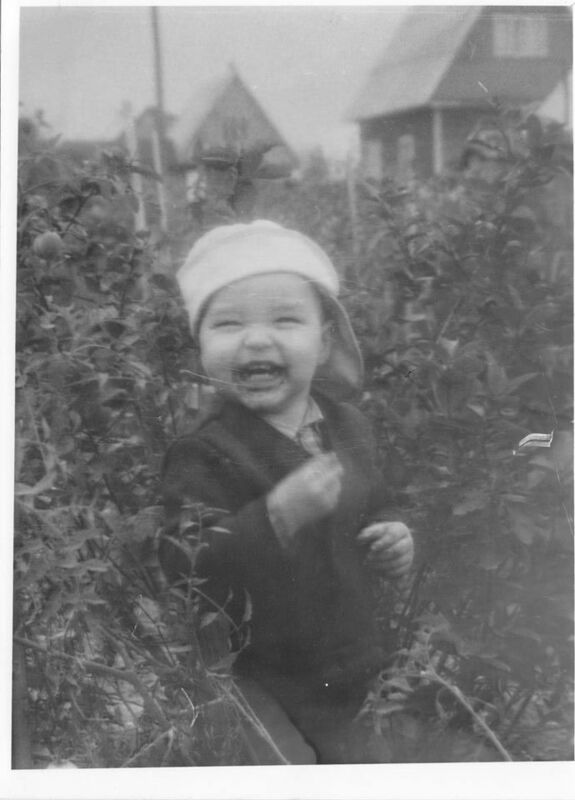 My son is enjoying the black chokeberries in 1988. ‘Blueberry Muffins’ sounds very ordinary, I know. But these muffins are gluten and sugar free, and they are an absolute delight. Also this recipe required lots of experimentation. And while experimenting, I came up with a new idea for the recipe using Dates. It will be coming soon. 1. Turn the oven on at 180c. Prepare the muffin tray and insert paper cups. 2. Mix all dry ingredients first: flours and sugar, and then blueberries. If using frozen blueberries, don’t defrost them, use as is. 3. Add bi-carbonate soda to the yoghurt and mix well. The volume will expand two-fold from the reaction, and if not then add a few drops of lemon juice or apple cider vinegar. Add yoghurt mixture to the bowl along with the egg and oil then quickly mix all the ingredients. 4. Divide the mixture between 6 muffin holes using two spoons. If frozen blueberries are used, the dough will look very thick. That is good, just press into the form with the spoon. 5. 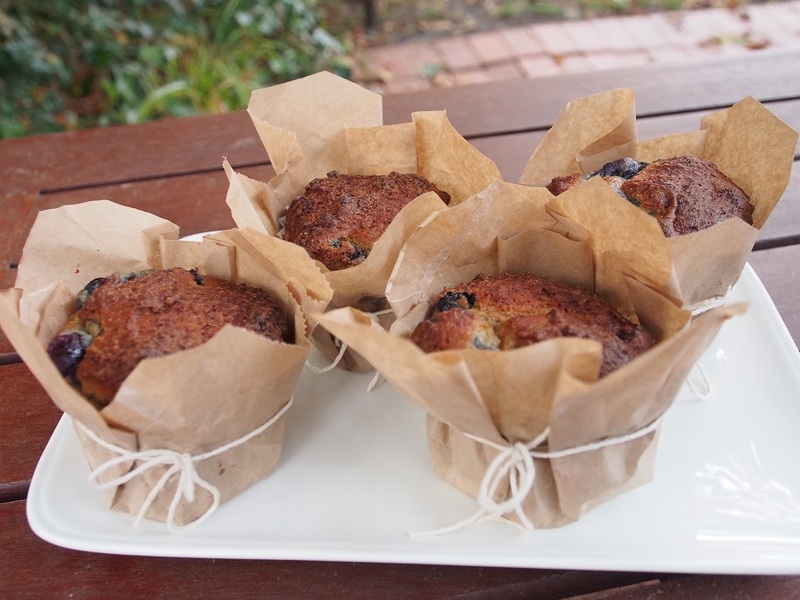 For fresh blueberries – bake at 180c for 20-25 minutes, and 25-30 minutes for frozen.